Executives should prioritize if they want to be effective. Keeping this in my mind, I wrote to my notebook screen and mobile phone screen three upto five most important projects I should allocate my time. In this manner, it is easy to resist urgent but non-important problems and keep focusing instead of drifting. In 1890, there was a cocktail party in Pittsburgh. Andrew Carnegie, who was a leading figure in American steel industry was also attending to the party where he was introduced to Frederick Taylor, the man who invented scientific management and at that time he was becoming famous for organizing work. “Youngman,” said Carnegie, loooking doubtfully at the consultant, “if you can tell me something about management that is worth hearing, I will send you a check for ten thousand dollars.” (ten thousand dollars was a great money in 1890). Conversation stopped as the people nearby turned to hear what Taylor would say. “Mr. Carnegie,” Taylorsaid, “I would advise you to make a list of the ten most important things you can do. And then, start doing number one.” And, the story goes, a week later Taylor received a check for ten thousand dollars. 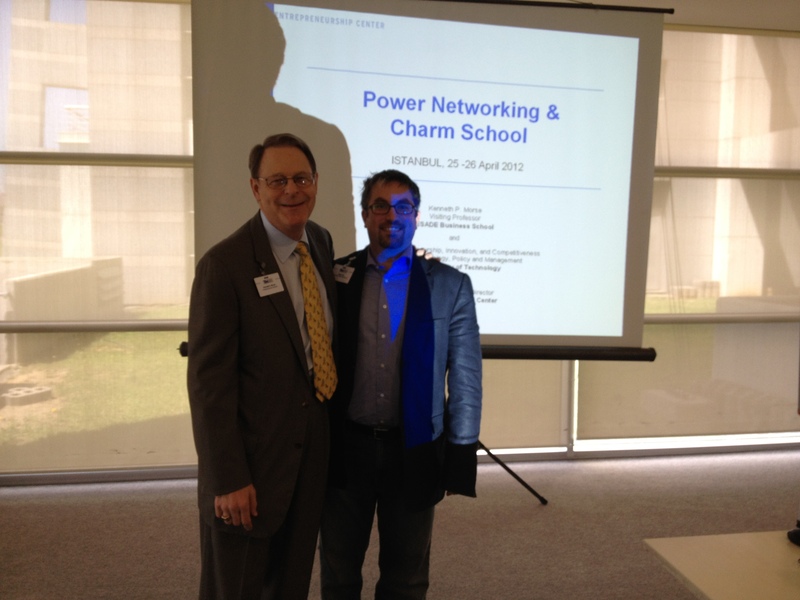 Global Entrepreneurship and Innovation Workshop series in Istanbul by Ken Morse and Laura Morse was great! I am very lucky because I have attended to the following series of three workshops under the leadership, advice and monitoring of Kenneth Morse and Laura Morse. 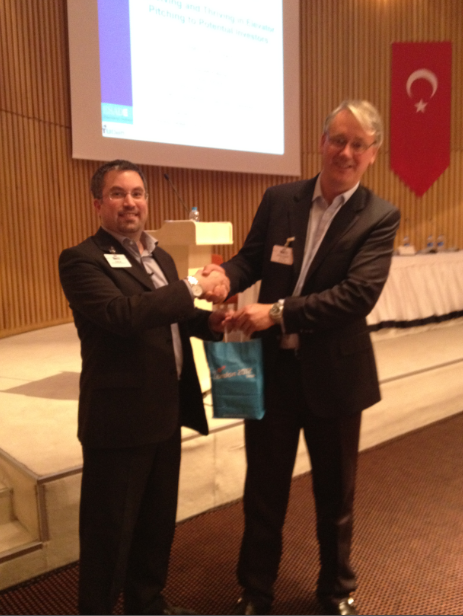 Thanks to Mr. and Mrs. Morse; Turkcell, TIM and all other sponsors for this great workshop. The target profile for the workshops was “Ambitious Turkish Entrepreneurs“; thus distinguished and successful entrepreneurs as well as investors have attended. Ken and Laura Morse invited great people to serve as a jury member to all of the “pitching training sessions” that have been done after the workshops in the evenings. The workshops provided us not only great insights but also to meet and network with numerous great entrepreneurs and investors. Ken Morse’s training styple is highly interactive, providing useful advices that work, urges us to think deeply to his insightful questions. He is the most result oriented business person/entrepreneur I have ever met. He serves as a role-model for how to be a successful global entrepreneur. In all of the workshops, he consistently emphasized the importance of pitching (to customers, investors/VCs and during recruiting for your company), anticipating the pains of the counterpart, the importance of asking relevant questions, finding top notch people, and practicing in order to be prepared for a sales pitch. He did not only tell us “what to do”, but also “how to do”. He says “everything counts”. Thus, he even told us the place where we should stand in a meeting or in a coctail, the contingencies, timing and content of our effective pitches. In all of the workshops, we learned effective strategies of selling, finding fund and recruiting; as he frequently reminds “hope is not a strategy“. Mr. and Mrs. Morse told us great advices from real life experiences and case studies. Since they were involved in most of those cases, it was a priceless learning experience to listen directly from them. learned and practiced of “an effective elevator pitch” to potential customers. learned how to select the initial and next vertical markets and how to dominate the markets globally. learned how to sell to a committee (the one with the pain, the one with the decision makers and Mr. No). Spotfire HBS case for creating a multinational start-up and success factors for technology based entrepreneurship. the opportunity to listen to Graham O’Keeffe (Partner of Joy Capital) for the key concepts of entrepreneurial financing and Eric Achtmann (Managing Partner of Global Capital Advisors GmbH) about VC’s and management boards. attended to the panel chaired by Özlem Denizmen (Dogus Group), Mustafa Say (Access Turkey Capital Group) and Deniz Ilkılıç (IMKB) with the presentations of Ferhat Pekin (lawyer) and Kaan Gur (VP of Akbank). We have practiced to have several elevator pitches to venture capitals. learned from Laura how to recruit, motivate and retain top notch people. discovered our management profiles (which has been assessed before the workshop with an online test). practiced pitch exercise to recruit a potential new team member. learned the lessons on leadership from “12 Angry Men” which was terrific and inspiring. discussed Meg Whitman (eBay) and Mark Ain (Chronos) cases. listened to Yusuf Azoz’s (CEO of kariyer.net) career evolution. Have You Met With My Advisory Board ? On the eve of critical business decisions or during tough times, I try to imagine what would these great people would mentor me with their valuable suggestions if they were alive and exists in my advisory board. Atatürk provides answers about leadership, vision, execution and strategy. Drucker provides insights about effective management, Steve Jobs about innovation, style (e.g. UX) and innovation; Napoleon Hill’s positive thinking and achievement oriented mindset destroys my cognitive burdens and fallacious limits; Dale Carnegie helps when there is a need for better communication and motivation. And last but not least, Matsushita stands as a legend figure for entrepreneurship, philosophy and philanthropy. Atatürk says: You should strive to be economically independent. Thus, concentrate on producing B2C products and envision a larger, global market place. In this new era, you can only win victories by serving the needs of global markets with great products. Drucker says: Exchange “markets” with “products” in my question to Jack Welch and seek your own answer: which markets will your company be number 1 or 2? Try to build your products on your strength and stay effective by prioritizing your product endeavours. Napoleon Hill says: Whatever you can believe and conceive you can achieve. Do not forget this. I do not know any single product in your industrial domain (mobile phones was not invented when I was alive) but I believe that your company can easily produce compelling applications if you have already developed a “Definiteness of Purpose” in your company. You are lucky because you have already acquired a mastermind alliance that consists of us. Dale Carnegie: You can not always find the exact answers. Do your best to create a working environment in which you provide the questions, and your colleagues would provide the answers with great faith and confidence. Try to help during their self actualization process, after which they will appear with the right answers and products. Do not neglect to acknowledge their suggestions and ideas. Encourage your employees and treat them nicely and in justice. Matsushita: Do not seek to create products to earn more revenues. If you will create products that will serve the needs of the society and create value, then you will automatically gain money. When you gain money, do not hold the money, distribute some of it to the best needs of your society. Always remember to have an appropriate profit. Without profit companies will not be able to contribute wellness to society. which reminds the recruiter to hire the best people, who may even be smarter and more talented than than the recruiter. The ones who hire people who are not great – for the sake of their own security – cause mediocrity in the organization. These people (the B’s) tend to consider great people as a threat to their positions. They are wrong. Andrew Carnegie, one of the greatest businessman/entrepreneur, wrote in his tombstone: “Here lies a man who knew how to enlist the service of better men than himself”. Jim Collins, author of the book “Good to Great“, asserts that great companies got the right people on the bus before they became great. Jim emphasizes the importance of great people in order to become a great company. As an entrepreneur I have observed many times that A’s hire not only A’s but also A’s attract A’s into the organization. Thus, this brings a vicious cycle that breeds success. I have never witnessed a superior success with a team which consists of only B’s or C’s. 1) How to find and attract A’s? 2) How to keep A’s stay in the organization? How to create engagement in mobile apps? Axiom 1: User engagement is an important factor for monetizing mobile apps. More engagement means greater impressions and great impressions attract revenue in every kind of the business model (e.g. Advertisement, InApp, Subscriptions, App sales or Sponsorships). What are the metrics for engagement? Users: # of users who downloaded the application. Active users: who use the application at least once in a month. What is the percentage of our active users? (i.e. active users / all users). Frequency: How many times a day/week/month our applications is used by active users? Duration: In each session, how many minutes/hours our active users continue using our application? How do we create engagement in mobile apps? Here are three easy and straightforward principles we follow. These are easy to articulate but not that easy to implement. First, we dedicate a great time and energy on the storyboard of the application with a great emphasis on User Experience (UX) and Game Mechanics (GM). User experience is an essential factor for creating great applications and game mechanics/gamification is essential to keep player motivations high. Good examples for good game mechanics are included in Foursquare mobile application and World of Warcraft. We do benchmarking (for the best applications in the app store), research (we read blogs of the successful application developers and also academic publications such as MIT Technology Review, and all UX and GM related books) and we experiment. Our storyboards are detailed so that any developer and designer can get the whole idea by just looking at them. We use “Minimal Viable Product (MVP)” Strategy which insists to focus on the “core value proposition” and related functions and evaluate others for future releases. Second, we try to develop a high fidelity prototype as early as possible and do usability testing at an early stage. In this phase we are so open minded that we are even ready to change the whole storyboard if we have a better idea or the application is not perceived to be simple and intuitive. Third, after our application is live, we continuously receive feedback from our users, continue usability testing and do the neccessary corrections and new additions without sacrificing our principle of MVP (this resembles Kaizen principle). We learn from our past mistakes and try not to repeate them again. We strongly believe in excellency through iteration. How do we evaluate UX design of our mobile apps? This is pretty straightforward. There are three metrics. Effectiveness: Are users able to do what they intend to do? For example during usability testing are users able to achieve their tasks in their scenario? Efficiency: Are users able to accomplish their tasks within an appropriate time and with a little cost? Satisfaction: Are our users happy to use our application? Do they re-use them after a while? For example engagement metrics are a good result for revealing satisfaction levels of our users. Product development is a multidisciplinary endeavour. Design, engineering and marketing perspectives must be incorporated into the process neatly. Since these perspectives have tradeofs, they frequently contradict. That is why, a balance must be met between these contradicting views. And that is generally the entrepreneur’s responsibility to find the perfect fit. I would like to list common mistakes in product development which I either observed or experienced personally during new product development. Antoine de Saint-Exupéry accurately highlights this fact: “Perfection is achieved, not when there is nothing more to add, but when there is nothing left to take away“. Pareto principle is also applicable (80% of results are produced by 20% of actions/causes). It is important to find these 20% features and discard the remaining ones. Steve Jobs’ determination on putting a “one button” for iPhone is a good example. As opposed to common assumption, consumers are not rational when they are involved in a “buy” decision. Rather then finding all the alternatives and decide according the predefined criteria, they satisfice (Herbert Simon), meaning that they select the option that is both satisfactory and sufficient. Consumers decide which product to buy mostly according to their emotions. So when designing a product, cost-benefit analysis should not be the top priority. Instead, creating a value proposition, concern on esthetics, consideration of the psychology of the consumers and creating a rich user experience should be considered. Most successful designers care their target segments’ feelings (i.e. how do they feel when they buy or use the product? Does the product differentiate their status among their friends and etc). Responsibilities of marketing professionals should not begin when the product is ready to be launched. Instead marketing people should be involved in the process from the beginning. New product development is not solely business analysts, engineers or designers responsibility. For example, in a banking industry, when a new software application is considered, the common procedure is that marketing or business development department wants a new product (i.e application). Business analysts specifiy the requirements. Business analysts role lie in between the marketing and engineering departments. Then programmers/engineers code the application, and then they are being promoted by the marketing department. I insist that the above procedure is fragmented and is not customer oriented. It begins from a customer need (from a marketing perspective), continues with an engineering mindset and then ends with a product that is somehow satisfactory. But in order to meet and surpass customer needs and expectations, customer perspective should always remain throughout the whole procedure. This mistake prevails especially in big companies and is not common in startups because their concentration is on the single product which the success of the whole company depends on the product and entrepreneur involves in the whole process and be the voice of the customer trying to create value through simplicity and user friendly designs.